Spain's regions offer organisers in the know striking alternatives to the established favourites. Although Spain is Europe's second largest country by area after France, event planners can be curiously myopic in appreciating its appeal. The twin charms of Madrid and Barcelona are well known, while the sun drenched Costa del Sol receives repeated bookings, but there is much more on offer. P&MM events manager Pia Zeyss organises car launches that call for destinations that are literally off the beaten track. "There are so many beautiful places you can choose from in Spain, such as Montserrat, Toledo and the walled city of Segovia," she says. "We have used the Fair Play Benalup property in Cadiz for a car launch. It's in the middle of nowhere but has great golf and a spa, and each of the rooms is a suite." Grass Roots Spain director of operations Pilar Garcia pinpoints the north of the country as presenting a completely fresh Spain for groups. "It is becoming increasingly popular for the Spanish market, but the UK has yet to catch on," she says. "It's main appeal is the sea and the mountains, but it's not Marbella." The Basque Country allows groups to take in San Sebastian and Bilbao. The beach city of San Sebastian is judged by some to be the best place to eat in Spain. As well as 18 Michelin stars scattered across such renowned establishments as Arzak and Akelare, there are countless less heralded tapas bars that serve up variations on the region's fish and seafood-based cuisine. The opulent Hotel Maria Cristina, overlooking the River Urumea in the city centre, provides a stylish base. Offering 108 rooms, and 28 suites in Belle Epoque style, the largest of its five meetings spaces, the Excelsior, seats 300 theatre-style or 260 for a gala dinner. Nearby Bilbao brands itself the cultural heart of the Basque region, particularly since Frank Gehry's Guggenheim opened in 1997. The 135-room Hotel Silken Gran Domine Bilbao located opposite the museum reflects its neighbour with a modernist style and is the ideal bolthole for exploring the city. Further along the north coast, the Asturias region is an undiscovered gem, where activities relate to the outdoors and food. Participants can choose from cheese tasting and cider-tasting, cookery lessons, as well as quad-biking or kayakking. The main city, Oviedo is famous for its cathedral, which mixes different architectural styles, and its historical centre. In recent years, the area has also been developing a film industry. Its annual Prince of Asturias awards are the local Oscars, and Woody Allen featured Oviedo in his film Vicky Cristina Barcelona. Hotel Barcelo Ovideo Cervantes is a new, modern property in the centre of town. It has 12 meeting rooms that can hold up to 200 delegates. For a more traditional feel, the Hotel de la Reconquista offers 142 rooms and nine meeting spaces, for up to 500 delegates. 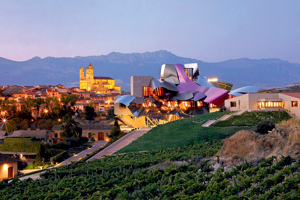 Wine buffs can head south and inland for La Rioja. The smallest of Spain's regions is responsible for the famous wine that it names and there are more than 500 bodegas producing in the area. Black Tomato director of events Jacqui Wylde recommends another distinctive Gehry landmark. "For incentives, the Marques de Riscal, Elciego hotel is in a great wine area," she says. "It is striking and very different." The property also has a Caudalie Vinotherapie spa with 14 treatment rooms and a wide variety of wine therapy treatments made of grape extract. Many of the property's 43 rooms overlook the vineyards. Moving further south, Spain's largest region Andalucia has more to offer than the sun-drenched coastline. The country's Moorish influence is most evident here with buildings that owe more to the Arabic world than the European. Grass Roots recently ran an incentive programme for a fuel client at the Barcelo La Bobadilla, a five-star hotel situated between Granada and Malaga. Group project manager Chris Zacher says: "It is set in its own estate, with acres of beautiful scenery and has the feel of a secluded Andalucian village. We arranged a cruise along the coast and a private viewing of the Alhambra. Activities on offer include horse-riding and cookery classes, or just relaxing in the wonderful spa."